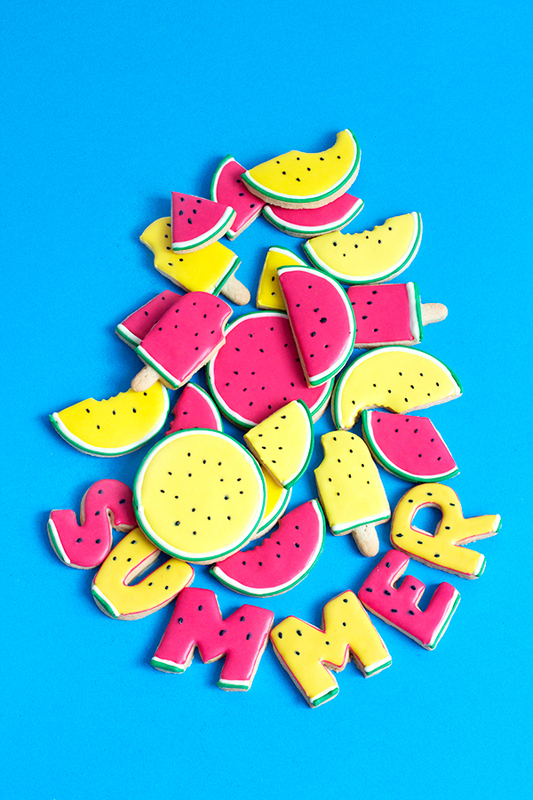 For me, few things spell out summer like a fresh batch of juicy watermelon slices. 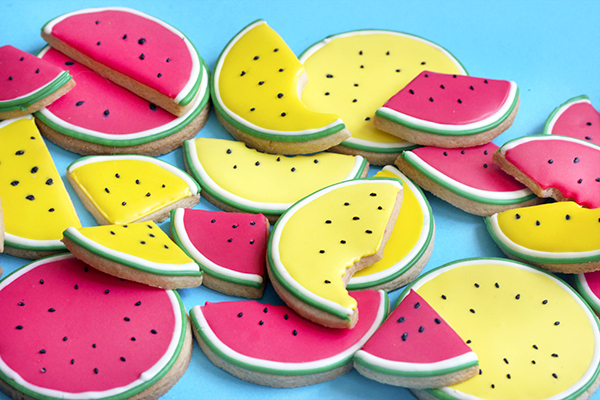 This season, help yourself to a happy serving of watermelon sweetness and give these cookies a try. Once you master this technique you can apply it to so many shapes! Try ice pops and letters, like I did, or come up with new ideas! 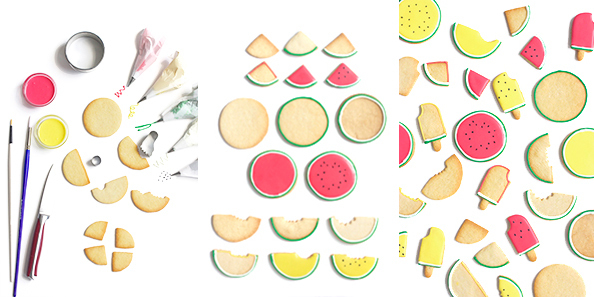 Materials needed: Circle cookie cutters (one large, one small), foot cookie cutter, or something else to use to take a jagged “bite” out of the watermelon, sugar cookie dough (I use this recipe) prepared, chilled and rolled out, royal icing (see my favorites here), food coloring, parchment paper bags (or plastic if you prefer), #1.5 or #2 pastry tips, small paint brushes. Use the larger circle cutter to make watermelon cross-sections. For the slices, hand cut the large circle in halves or quarters with a paring knife. Use the small circle cutter to cut out a smooth bite or for a toothy bite, use the toes of a small foot cutter. Place the cookies onto a parchment lined cookie sheet. Bake at 350° until the edges are slightly brown, about 9-12 minutes. Smaller cookies will take less time to bake. Let cool. Prepare small bowls of icing in reddish pink, yellow, green, white and black. Add small amounts of egg white or water to the bowls of royal icing to achieve a consistency similar to that of toothpaste – this will be your piping icing. Cover the bowls with a damp cloth when not in use to keep the icing from crusting over. Add the green, white and black and only half of the pink and yellow to individual piping bags fitted with pastry tips. Thin out the remainder of the pink and yellow by slowly adding egg white until the icings reach the consistency of maple syrup. This will be your flooding icing. Keep covered, and set aside for later. Pipe a line of green icing along the edge of each cookie where the rind should be. Right against the green line pipe a white line. Next, pipe a line of pink or yellow icing along the remaining edges of the watermelon halves and quarters. It is not necessary to pipe a line of pink on the round cookies.Using the pink or yellow flooding icing and a small brush, flood the cookies, pushing the icing up to the white lines being careful not to cover them. Next, add the seeds. You can proceed immediately while the icing is still wet, though you risk the black icing bleeding a little into the pink as it dries. Take the piping bag filled with black and make seed shapes on the slices. If you want to ensure that there will be no bleeding of colors, wait 4 hours or overnight until the icing is hard and then add the seeds. 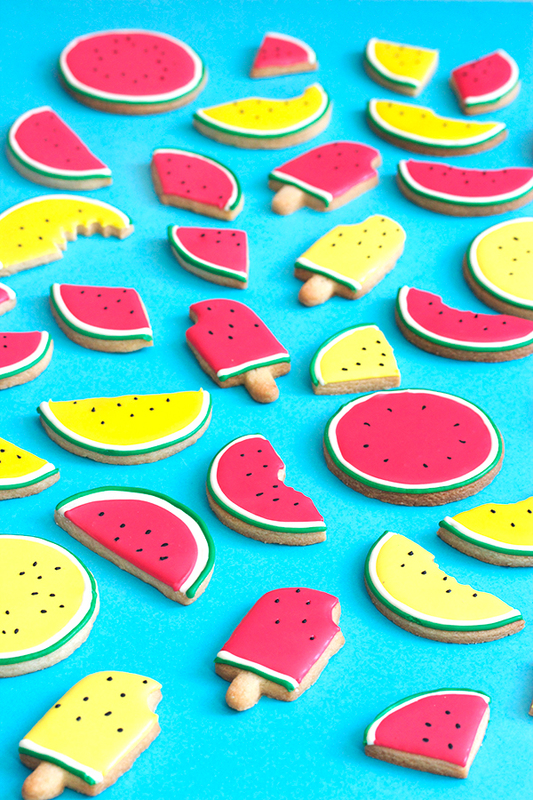 These look so nice, I have so many cookie cutters that I really should start putting them to use! 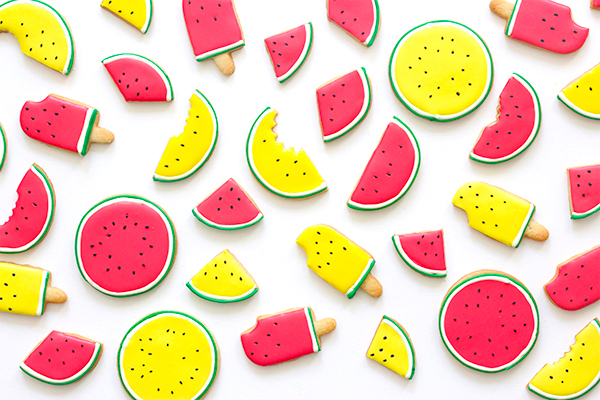 Wow, they are so colourful, almost too cute to eat! These are so so so cute! You just made my day. I have this current obsession with everything watermelon so these are truly treats. 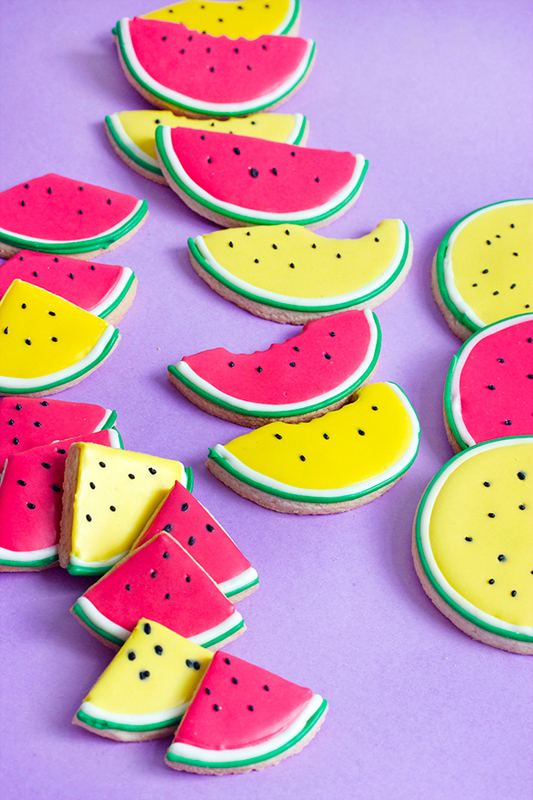 The colours in these cookies look amazing! Perfect for a summer get together. Hi- love your cookies, your Instagram, your blog, your talent! I was wondering if you would be willing to share what you use for your background color? Looks so good and I would like to enhance my cookies with colorful backgrounds. Thanks in advance! Thanks so much! Currently I am using pare sheets of colored paper from an art supply store. The problem is that the butter in the cookie, especially when the cookie is very fresh, stains the paper so you have to get your design figured out pretty quickly.